Few things in life are certain. Reliable. Forever dependable. This stuff is da bomb diggity. Bag it up. And then I did some research and heard about Aquaphor. And light shone down from the Heavens. Angels started singing. It was amazing. We still use it on Carlitos after every shower. And of course, we use it on Xavi, too. The poor thing has a serious case of ‘winter face’ emerging to match his ‘teething face.’ (For any non-parents reading, these both translate into ‘red, red, red, rashy face.’) But all will be well after a few days of Aquaphor. 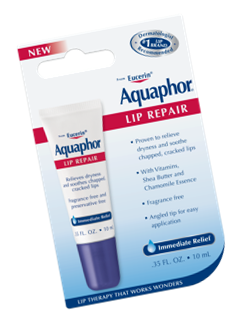 And Aquaphor isn’t just for kids and babies! Adults can use it, too. In fact, I was among the first to try their new Lip Repair before it came out on the market earlier this Fall and still have an extra sample or two. Let me tell you that my friend (ahem, you know who you are) has been hounding me to ‘PLEASE FIND THAT LIP REPAIR, Annie!’ She is becoming a bit fiendish. Again, this stuff is good, I tell ya. So, now that you’re feeling all fiendish yourself. Now that you need to get your hands on some Aquaphor. What to do? What to do? You could post a comment below and be entered to win a gift set (worth $33!) as shown below! And because I am really awesome (alright, alright, because Aquaphor is really awesome), TWO of you are going to win this weeks prize! So, comment away, people. * Do your part to keep ‘winter face’ at bay. And, to my fiendish friend, here is your chance to win the Lip Repair (and then some!) even if I can’t find those samples for you in my disorganized pigsty pristine and organized home. *All you have to do is leave a comment on this post between now and Monday at 11:59 am. I will announce the winner at noon on Monday. It will probably be the easiest thing you do all weekend. This entry was posted in Free Fridays! and tagged Aquaphor, Free Friday!, Healing Ointment, Lip Repair, winter face. Bookmark the permalink. Follow any comments here with the RSS feed for this post. Post a comment or leave a trackback: Trackback URL. 11 Responses to Free Friday! Oh oh oh! We are huuuge aquaphor fans! And our tub is almost done! And Cole has teething chin and dry patches on his back! And Addie keeps licking her lips so she has a weird dry patch!! So in conclusion—I would loooooove to win this week! Oh this would be great! My older son gets wicked excema and has VERY sensitive skin, and this stuff works AMAZING for him, as well as for my youngest! The cold and winds definitely give them that “winter face” as you were saying :)…thanks so much for offering up these goodies! Just brought twins home this week and know that we are in for a rough winter. Their older sis already has dry patches on her back (of all places). Loved the samples of Aquafor that they gave us before we left NICU! As soon as we run out of our current lotion, we’ll be giving it a try. phinnie has the lovely teething/winter face too!! and i definitely need the lip repair. i have permanent chapped lips…this could be the cure i’ve been waiting for!!! I live in Michigan (for two more months…) I feel like that says it all. It is SO cold and dry here. And it is more fun to enter this contest than to study for my last law school exams ever. And I have a 2 year old. i am outing myself now: i am said “fiendish” friend who really really wants to have the lipbalm!!!! I love a contest… hook me up aquaphor. hook. me. up. 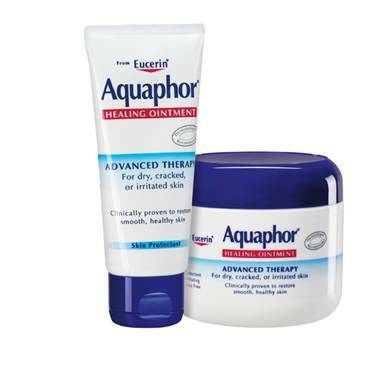 Love Aquaphor! And we already have rough patches that our Aveeno Baby lotion is not fixing. Time to switch to our winter lotion! My lips are constantly dry in the winter time and I have not been able to find a product that keeps it moist and protected. The same goes for my hands. They become grotesque in the winter time–dark and dry! Maybe Aquaphor is the the answer!